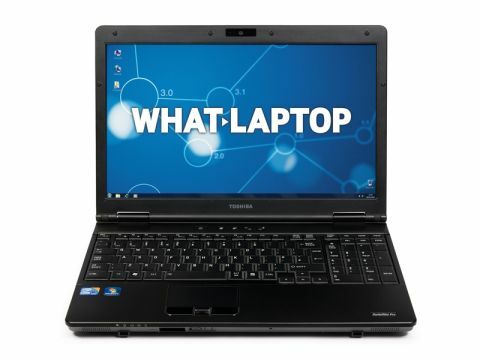 Toshiba's Satellite Pro range aims to strike a balance between a work machine and a home laptop. The S500-15W is a strong performer and has an excellent array of features that help it to stand out in the crowd. At 2.6kg, this laptop is only marginally heavier than the Acer Aspire 5552 and the Zoostorm 3389. It can certainly be carried around if needed, but the Dell Adamo 13 inevitably proves a much slimmer and lighter option. The chassis is reasonably solid with just a little flex, although the black plastic design looks a little cheap. However, the screen tilts all the way back to horizontal, letting you find your ideal viewing angle. Although it isn't the brightest display, images are colourful and pleasing to the eye, thanks to the glossy Super-TFT coating. Unfortunately, this also means that it's fairly reflective. This laptop features an Intel Core i3 370M processor, which provides stunning performance. The Toshiba racked up some high scores in our benchmarking tests, proving it could comfortably multi-task with a number of programs without slowdown. Despite this strong performance, we managed to use it for 272 minutes away from the mains, which is almost as good as the Dell Adamo 13. Similarly, while a basic integrated solution has been used for graphics, this laptop almost doubled the performance of the Dell and Zoostorm 3389. While you won't be able to run the latest games, we found high-definition video played smoothly. The touchpad is a little compact, but it's also responsive, with two firm mouse buttons. The keyboard is comfortable to type on with well-mounted, bevelled keys and a dedicated numeric keypad. You should have enough space for your files on the 250GB hard drive, which features anti-vibration technology to prevent damage during transit. Those with large media collections will, however, be better served by the Zoostorm 3389 and Acer Aspire 5552 machines, which offer 320GB and 500GB storage space respectively. Networking is speedy, however, with both 802.11n Wi-Fi and Gigabit Ethernet onboard. There are plenty of other features, such as a fingerprint scanner for extra security and an ExpressCard slot for upgrading the laptop. There's also a DisplayPort connection, a VGA port for hooking up to an external display, and one of the USB ports features Sleep-and-Charge technology, for charging peripherals even when the laptop is in sleep mode. The performance and features of the Satellite Pro S500-15W make it a worthy Silver award winner. Only the Dell Adamo 13's sleek, highly portable form kept this machine from winning the Gold award.